The news and releases for the OSI SAF High Latitude processing centre are now also accessible via a RSS flux. You can easily syndicate to this flux by clicking on the RSS icon or by adding the address http://osisaf.met.no/news/news-rss.xml to your favourite News Reader. As reported in service message #1803 and #1804, some of the high latitude SST and Flux products (OSI-203, 301 and 302) have experienced problems. A temporary solution was set up on Friday 29th March. We now have a permanent solution in place and the production is back to nominal. This includes a change to the newest NWP data from ECMWF. This change is expected to have minimal impact on the product quality. We are currently experiencing problems with the production of some L3 High Latitude SST and Flux products: OSI-203, OSI-301 and OSI-302. This is due to a change in the input NWP data that had unexpected consequences. At present this problem will cause the next products to contain only missing data, until we find a way to fix the problem. We are sorry for the inconvenience this might cause. We will be back with more news tomorrow. L2 products - a dedicated SNPP VIIRS Northern High Latitude product is being introduced. This product is labelled OSI-205-b, and comes in addition to the existing OSI-205-a, based on Metop-B AVHRR data. OSI-205-b is produced for each orbit of SNPP VIIRS data provided through the EARS regional service. The two L3 products will replace the current multi-sensor product (OSI-203), which will be discontinued on 10 September 2019. Users are therefor encouraged to start using the OSI-203-a and OSI-203-b products instead of OSI-203. As announced previously in our OSI SAF service message #1664 we proceeded to upgrade our "Medium Resolution Sea Ice Drift" product. Please notice that OSI-407-a replaces the previous product OSI-407. As announced previously in our OSI SAF service message #1665 we proceeded to upgrade our "Ice and Sea Surface Temperature" product. Please notice that OSI-205-a replaces the previous product OSI-205. As part of our commitment to provide you with better data, we are pleased to inform you that we are upgrading our product Global Sea Ice Emissivity OSI-404 on Thursday the 9th August 2018. We have added the effective emitting layer temperature in addition to the emissivity. The variable name is Effective Temperature (teff). The sea ice self emission brightness temperature is the product of the emissivity and the effective temperature. The effective temperature is computed using an empirical algorithm and the 6 and 10 GHz data from the AMSR2 instrument. We have added spatially and temporally varying uncertainties to the emissivity product. The variable name is Uncertainties (u). Uncertainties are provided for the user to estimate the quality of each individual data point. We have updated of the emissivity algorithm coefficients. This was done to minimize biases between the new daily and continuous validation methodology and the emissivity product. Other than that, you should know that the product structure (file naming, variable names, dimensions, resolution) remains the same. You can find a 5-day sample on ftp://ftp.dmi.dk/sat/ssmis_emiss/OSI-404-a/ . In case you want to compare it to the current product, you will find the data for the same dates on ftp://ftp.dmi.dk/sat/ssmis_emiss/OSI-404/ . Should you have any questions, do not hesitate in contacting us. Two OSI SAF sea ice experts, Thomas Lavergne (MET Norway) and Rasmus Tonboe (DMI) are helping ESA in preparing for a Passive Microwave Satellite Mission for EU Copernicus. The instrument is called the Copernicus Imaging Microwave Radiometer (CIMR) and is one of the High Priority Candidate Missions for expanding the Copernicus Space Component with a Polar Imaging capability. Thomas and Rasmus are on board the CIMR Mission Advisory Group (MAG). Jacob Høyer (DMI), an SST expert and OSI SAF member, is also in the CIMR MAG. On 14th May between 07 and 13 UTC there will be maintenance on the main infrastructure at MET Norway. This infrastructure is used for distribution of OSI SAF sea ice and high latitude SST and Flux products. The maintenance is planned so that it should not interrupt the distribution of OSI SAF products, but there is always a risk for interruptions during such maintenance. This message concerns a minor update to the OSI-401-b (Global Sea Ice Concentration (SSMIS) product. The update will affect netCDF product files, starting from those with the timestamp 2018-04-23. Currently, OSI-401-b uses the following instruments: SSM/I F15, SSMIS F16 and SSMIS F18. Due to a degradation of the F17 data, the use of this instrument in the OSI-401-b product was stopped in November of 2016. F17 will be put back into operational use, as it is now operating nominally. Also, F15 will no longer be used, due to the age of the instrument (it was launched in 1999). Therefore, after this update, the following instruments will be used in the generation of the product: F16, F17 and F18. Additionally, a “coastal_correction” flag, which is currently missing, will be added to the netCDF file attribute for the “status_flag” variable. The flag is included in the “status_flag” variable even though it is currently not referred to in the netCDF attribute. The production outage at the OSI SAF High Latitutde center that was announced yesterday has now been resolved and the production is back to nominal. The impacted product and dates are listed below. Sea ice edge (OSI402-c): product labelled 20180411 product delayed, now available on FTP. Sea ice type (OSI403-c): product labelled 20180411 product delayed, now available on FTP. Continuous reprocess ice concentration (OSI-430): product labelled 201803101200 delayed on FTP. AHL SST (OSI-203): product labelled 201804111200 delayed, now available on FTP. AHL SSI and DLI (OSI-301+302): product labelled 201804110000 lost. Products not mentioned here were not impacted. The AMSR2 ice concentration product was degraded for the products labelled 20180310 and 20180313. We believe that we have identified the source of the error (a malfunction in the production machine). We have now replaced the faulty production machine and will monitor the production closely for further errors. The OSI SAF High Latitude FTP (ftp://osisaf.met.no) and HTTP (http://osisaf.met.no) servers will be moved to a new host tomorrow 11.01.2018 at 14:00 CET. This should have no practical implications for users, but in case you experience any unusual behaviour, please contact us at osisaf-manager(at)met.no. The MR sea ice drift product (OSI-407) experienced an production outage between 5th and 6th January. The problem has been fixed and the processing is now back to nominal. The OSI SAF High Latitude FTP server experienced an outage on 5 and 6th January, due to an internal upgrade that gave unexpected problems. The problem has been fixed and the FTP server is now back to nominal. Todays sea ice concentration product (OSI-401-b) was 3 hours delayed due to a production anomaly. The production is now back to nominal. An issue with the production chain for the sea ice concentration product (OSI-401-b) have caused some spurious ice to occur in the sea west off Iceland. The issue has resolved by additional masking. The update will be applied to products distributed from 2017-12-05 (labelled 20171204). As announced earlier, the GRIB and HDF5 formats of Global Sea Ice products from OSI SAF are planned to be discontinued. The date for this change is 5 April 2018. Users are strongly encouraged to use the NetCDF format as soon as possible. Currently, the products are provided in several formats (depending on the product and on the distribution mean) : GRIB, HDF5, NetCDF via HL FTP server osisaf.met.no and EUMETCast. On 5 April 2018, the distribution of GRIB and HDF5 formats will be discontinued. NetCDF3 format will be the unique format available for these products both on HL FTP server (osisaf.met.no), EUMETCast-Europe and EUMETCast-Africa. Please get ready to switch to the NetCDF files and do not hesitate to contact the OSI SAF team in case you have any concerns about it. A GRIB encoder can be made available on request to users who need more time to adapt to the NetCDF product files. The AMSR-2 sea ice concentration (OSI-408) and LR sea ice drift product (OSI-405) distributed on 25th November have a large sector of missing data due to outage of AMSR-2 data from the provider JAXA. Todays product is nominal, as the AMSR-2 data stream came back to nominal yesterday. For the multi sensor LR sea ice drift product, only the southern hemisphere product is affected, as AMSR-2 is the only sensor used during summer time. MET Norway will perform maintenance and upgrades in the infrastructure of computer facilities on October 18. and October 25. between 09:30 and 11:30 UTC, and availability of OSI SAF High Latitude FTP and HTTP servers might be affected. Although actions are taken to avoid downtime by using failover mechanisms, the extent of the work may result in unavailabliity of services during the maintenance window. Due to an outage of AMSR2 data from JAXA, todays OSI SAF sea ice products using AMSR2 data have missing sectors or reduced quality where the AMSR2 data are missing. The most affected product is the OSI-408 AMSR2 sea ice concentration product where sectors have missing data. For the multi sensor products OSI-402c ice edge and OSI-405c LR ice drift other data than AMSR2 (SSMIS and ASCAT) are used in the missing sectors. Here will be a planned maintenance on the MET Norway infrastructure 16th August, between 09:00 and 13:00UTC. This might impact the availability of the OSI SAF High Latitude FTP, HTTP and THREDDS servers. Users may experience a handful of minute-long interruptions of the services if the maintenance goes as planned, or longer if we get unforseen issues. If you experience problems after 13:00UTC, please notify us on osisaf-managermet.no. The OSI SAF High Latitude L3 SST product (OSI-203) with date stamp 2017-08-07 0000UTC is empty due to a problem with the AVHRR pre-processing. This pre-processing is now back to nominal, and the next OSI-203 product should be produced as normal. The empty product will not be reprocessed. have been stopped until further notice. This is because the ice extent calculation is tuned to the previous version of the sea ice concentration product (OSI-401-b). This product was updated on 3rd July to remove spurious ice, and the ice extent calculation needs to be recalibrated after this update. The filtered files will replace the existing product on the FTP server. The filtered GRIB files will replace the existing GRIB files on EUMETCast. The NetCDF files will be available at EUMETCast at a later date. We will keep users informed on when this will happen. Until 4 July 2017, the filtered files will continue to be available for users to evaluate from ftp://osisaf.met.no/prod/ice/conc_filtered – in parallel with the existing operational product. The file names have the temoporary prefix "filtered_". Spurious ice can occur in the OSI SAF sea ice concentration fields, due to uncertainty in the measurement over open water. This spurious ice is problematic for some users. An extra sea ice concentration field has been introduced, for which the sea ice concentration is filtered to remove spurious ice. The spurious ice is removed using two extra filters: a 2m air temperature and an open water filter. The OSI SAF sea ice concentration product OSI-401-b will be updated as follows: the existing (unfiltered) sea ice concentration field is replaced by a filtered sea ice concentration field and an additional masks variables has been added. This change applies to the three available formats: NetCDF3, HDF5 and GRIB. In case some users still want to use the unfiltered sea ice concentration, they can use the additional "ice_conc_unfiltered" variable, which is available in NetCDF and HDF5 files (but not in the GRIB files). In addition to the filtered ice concentration variable, a “masks” variable has also been introduced, which contains the T2m, open water filter and climatology masks that were used to filter the ice concentration field. The file names have the prefix "filtered_". These, filtered, files will eventually replace the existing product (at ftp://osisaf.met.no/prod/ice/conc and EUMETCAST) but without the "filtered_" prefix. We will keep users updated on when this change will be made. The filtered ice concentration field is described in more detail in the PUM and validation report (see http://osisaf.met.no/p/ice/updated_ice_conc.html for information on how to access them). The data from Metop-A ASCAT is delivered as usual again and the sea ice edge and type products are now using these data again. For low resolution sea ice drift only Metop-B ASCAT data is now used, as a consequence of the update of the product from OSI-405-b to OSI-405-c.
Due to an instrument anomaly on the Metop-A ASCAT instrument, the OSI SAF sea ice edge (OSI-402-b), type (OSI-402-b) and low resolution sea ice drift (OSI-405-b) products are produced without ASCAT data since 28th May. Therefore, the OSI-402-b and OSI-403-b products are produced using SSMIS data only and OSI-405-b using SSMIS and AMSR-2 data. The current OSI SAF sea ice edge (OSI-402-b), sea ice type (OSI-403-b) and low resolution sea ice drift (OSI-405-b) products have been updated. The updated products, labelled OSI-402-c, OSI-403-c and OSI-405-c, will replace the current products on 30th May 2017. For the EUMETCast distribution, the edge and type products are now also provided on NetCDF3 format, in addition to GRIB. GRIB distribution will be terminated on 5th April 2018. For questions, contact us on email osisaf-manager(at)met.no. The EUMETSAT Ocean and Sea Ice Satellite Application Facility (OSI SAF) team is pleased to announce the release of OSI-450, a new full reprocessing of its Sea Ice Concentration (SIC) Climate Data Record (CDR). The release provides a SIC CDR over the polar regions, derived from passive microwave satellite data of SMMR, SSM/I and SSMIS, covering years 1979 to 2015. 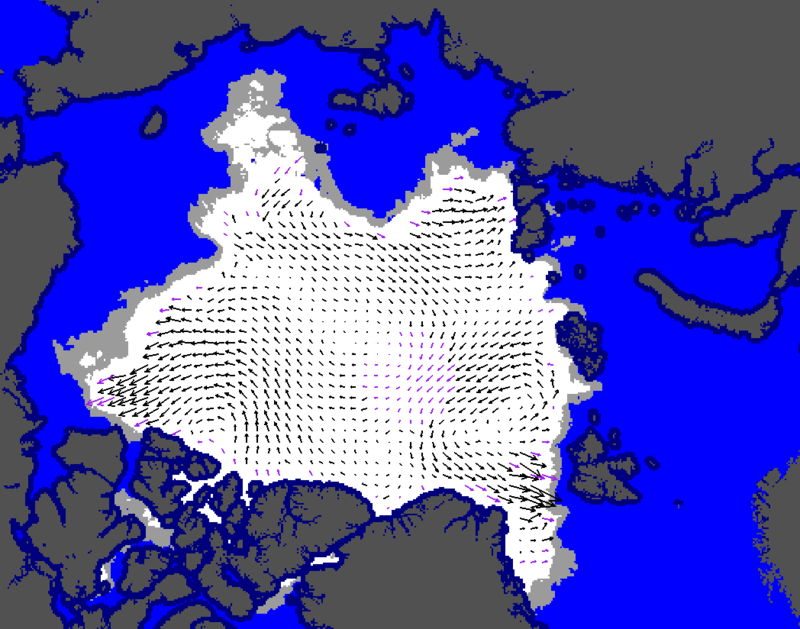 This is the second version of such a sea ice concentration CDR by the OSI SAF. The basic principles and methodologies that were the backbone of our previous CDR (OSI-409) are still featured in OSI-450 (e.g. atmospheric correction of brightness temperature with NWP re-analysis data, state of the art algorithms, dynamic tie-points, uncertainties, etc...). They were nevertheless all revisited for this new release, through dedicated R&D in the OSI SAF project and in the ESA Climate Change Initiative (http://cci.esa.int) Sea Ice projects, whose contribution is acknowledged. Key improvements embedded in OSI-450 are more accurate and stable algorithms, open water filters to limit false ice detection over the ocean, and more realistic uncertainty estimates. Interested users of OSI-450 are invited to explore and download the data from our website (http://osisaf.met.no) and FTP server (ftp://osisaf.met.no). A small change in the processing of the OSI SAF AHL SSI and DLI products (OSI-301 and OSI-302) will be implemented starting from 4th May 2017 (tomorrow). This change is only in the input data, as ECMWF NWP data will be used instead of HIRLAM NWP data. This change will not impact the data format and the impact on the product quality is minimal. The data volume is increasing a bit, from typical 315kB to 368kB for the GRIB files. This is due to that the files will have more data point with valid data with the new NWP input, but still without changing the format. We are pleased to announce that the High Latitude Level 3 Global AMSR Sea Ice concentration product will be operational available on March 16th 2017. This is a stand-alone ice concentration product, produced daily based on AMSR2 data (labelled OSI-408), and comes in addition to the existing ice concentration product based on SSMIS (OSI-401-b). The High Latitude L2 Sea and Sea Ice Surface Temperature product is now operationally available on EUMETCast and FTP. This product, in GHRSST compliant netCDF format, is a stand-alone High Latitude Level 2 Surface Temperature product. It consists of Sea and Sea Ice Surface temperatures (SST and IST) and an unvalidated test temperature field, Land Ice Surface Temperature (LIST) for the Greenland and Antarctic ice caps. The OSI SAF High Latitude FTP server was unavailable earlier today due to an internal network problem. Therefore the sea ice products and High Latitude SST and Flux products were unavailable through FTP. The FTP server is now back to nominal. Ice concentrations are now provided all the way to the coast, whereas OSI-401-a had a zone along the coast with unclassified pixels. Measurements near the coast can contain spurious ice, due to land spill over effects. OSI-401-a had a T2m filter, which removed false ice where the 2m temperature from ECMWF was warmer than 8°C; however, this is no longer applied. Differences in how the OSI-401-b ice concentration algorithm is implemented compared OSI-401-a may also be a factor. This program may remove some valid, low-concentration sea ice at the ice edge, in addition to the spurious one in open water. We apologise for any inconvenience that this has caused you. We will update you when we have a solution to remove the spurious ice, while keeping the valid ice. Due to the previously announced outage of SSMIS data from NOAA (on 18.10.2016), the continuous reprocessed sea ice concentration product (OSI-430) with date stamp 20161017 that was supposed to be delivered on 18th November is missing, and will not be delivered, as the data are lost. Except from this issue, production is running as nominal. The archive of global sea ice concentration, edge and type products on NetCDF/CF format has now been updated to partly correct for the misplacement error previously announced (on 21.09.2016) and corrected on the near-real-time production (on 27.09.2016). All netCDF/CF files since 2005 are modified. The update of the archived netCDF/CF files does not completly correct the misplacement error, as there is a residual error of ~3km that we can not correct. The new netCDF/CF files are available under ftp://osisaf.met.no/archive/ice, and the change is documented in the global attributes to each file. The GRIB and HD5 files in the FTP archive are not modified, as they either do not suffer from the misplacement error at all (the sea ice concentration OSI-401-a product) or only exhibit the residual misplacement error of ~3km that cannot be corrected (the sea ice edge and type products). Due to an outage of SSMIS data from NOAA, all OSI SAF sea ice products based on SSMIS data (OSI-401b, 402b, 403b, 404) are missing or with no data coverage in today's product (date label 20161017). The SSMIS data stream is now back again, and the products should be distributed as nominal again tomorrow morning. The products will probably not be reprocessed, since backlogged data will probably not be available. This outage do not affect the MR and LR ice drift product (OSI-405b and OSI-407). The small misplacement error (max ~7km) in the land mask and geolocation of the OSI SAF sea ice concentration (OSI-401-b), sea ice edge (OSI-402-b) and sea ice type (OSI-403-b) products on the polar stereographic grid will be fixed on 27th September 2016. A shift in the grid position will be applied to the products distributed on this date (with date stamp 26.09.2016) and onwards. This shift will change the grid latitude and longitude of the products, while the land mask is unchanged and will keep its position in the grid. This small misplacement error also affects the reprocessed sea ice concentration data record (OSI-409 and OSI-409-a) and the continuous reprocessed sea ice concentration product (OSI-430), but only version in the polar stereographic projection. The misplacement error will NOT be corrected in the reprocessed products, as a new version of the data record will be available early 2017. The misplacement error of OSI-401-b, OSI-402-b, and OSI-403-b was communicated to the users on 18th August and 26th August. For questions, please contact osisaf-manager@met.no. As announced last week, an issue with the grid of the operational OSI SAF sea ice concentration product was recently discovered. This issue has now been further investigated, and it turns out that there is a small error in the geolocation of some of the sea ice products and of the land mask that is applied in these products. These geolocation errors are small, less than one product grid box size. They affect the ice edge, type and concentration products and they affect differently the various file formats (hdf5, GRIB, netCDF). Our team is working towards fixing these small errors and the exact date for the fix will be announced later. We will also document the details about this on our webpage. This issue does not affect the sea ice drift products (OSI-405 and OSI-407) nor the emissivity product (OSI-404). The Sea Ice Concentration product delivered from OSI SAF was upgraded on 25th May 2016. This upgrade resulted in an unexpected shift in the product grid, a 10km shift in the y-direction. This shift is in all files with date stamp 25.05.2016 and later, and is still present in the files currently being distributed. This issue only concerns the Sea Ice Concentration product (OSI-401-b). The sea ice team is working on solving this issue. The latitude and longitude values on the single files available are also changed accordingly, so the ice data is placed geographically correct if the lat,lon or xc,yc values are used to position the data. But if the aggregated product available through the thredds server or the subsetting service is used, the data before 25th May 2016 will be 10km incorrectly placed, as the grid in the latest available product is used statically in these services. We are sorry for the inconvenience this might have caused, and hope to soon solve this issue. The distribution of the OLD OSI SAF sea ice concentration product (OSI-401-a) on EUMETCast will be stopped on Tuesday 9th August. The NEW sea ice conc product (OSI-401-b) will still be distributed. This new product replaced the old product in May, and the old product has only been distributed until now for users to adapt to the new product. As announces throgh service messages, there was an outage of the OSI SAF sea ice emissivity product (OSI-404) yesterday. The sea ice concentration product has also been experiencing some problems with interpolation of data around the pole hole. These issues was due to problems with the reception of input SSMIS data. The problems has been solved and the production is now back to nominal. This will result in better masking of the spurious ice recently present in these regions in the sea ice concentration product. This update is effective from the product distributed tomorrow (Jun 25 2016). Due to partly missing SSMIS data from DMSP F18 the OSI SAF sea ice edge product for the Southern Hemisphere distributed today (labelled 20160619) has a sector of missing data. The reception of SSMIS data is back to nominal, so tomorrows products should be complete. We are pleased to announce the pre-release (with status DEMONSTRATION) of OSI-405-c the next version of the OSISAF Global Low-Resolution Sea Ice Drift product (OSI-405 series). In addition, the input data sources switch from SSMIS F17 to F18, and from ASCAT Metop-A to -B. AMSR2 from GCOM-W1 is also used. Note that the sea ice drift vectors during summer (May-September in NH, November-May in SH) are mainly processed from the 18.7 GHz imagery of JAXA's GCOM-W1 AMSR2 instrument. The summer motion fields are of lower accuracy and coverage than those processed during the winter season, and this is reflected in the new uncertainty fields. Pay attention to the increased number of interpolated vectors (in variable status_flag). This product is released on a DEMONSTRATION basis to interested beta-users. We welcome feedback (osisaf-manager_at_met.no). The DEMONSTRATION status is used for products that have finalized their algorithm baselines, but for which operational implementation is not complete, nor fully validated. Changes in the DEMONSTRATION products may happen at short or no notice. We aim at full OPERATIONAL implementation in the course of fall 2016. The final date for the previously announce upgrade of the OSI SAF sea ice concentration product OSI-401-b has been set to 26.05.2016. The OSI-401-b will be replacing the current operational concentration product OSI-401-a on this date, so that the ice concentration files distributed on EUMETCast and FTP will be OSI-401-b. The OSI SAF off line product OSI-430 with updates to the reprocessed ice concentration data set, has also been temporary turned off, to complete implementation of use of SSMIS data from DMSP F18. The production of OSI-430 is expected to be back in nominal production 21th April. It todays sea ice products OSI-401-a, OSI-402-b, OSI-403-b a small sector has missing data. This is due to a temporary outage of SSMIS F18 data from the data provider (NOAA). Data flow is now back to nominal. The ice concentration (OSI-401-a) was updated 11.04.2016 and the products look fine. This product is back to nominal. The ice edge and type (OSI-402-b and OSI-403-b) was updated 12.04.2016. The products distributed 13.04.2016 04:30 UTC had a missing sector, but have now been reprocessed and are available at our FTP server (ftp://osisaf.met.no/prod/ice). The products look fine, and the products should be back to nominal tomorrow morning. The ice emissivity product (OSI-404) is temporary turned off. Production will be upgraded to F18, with expected implementation 19th April. The LR ice drift product (OSI-405-b) is back to nominal production (still using F17 data, since the high frequencies used by LR ice drift are not affected). The ice edge and type products (OSI-402 and OSI-403) will be updated to use F18 tomorrow, 2016-04-12. The ice emissivity product (OSI-404) has been temporary turned off. Production will be upgraded to F18, with expected implementation 19th April. The LR ice drift product (OSI-405) does not use the channel with calibration problems, but is affected to some extent since it uses the ice edge product to define areas with ice. This product will be back to nominal as soon as the ice edge product is updated. We are sorry for the inconvenience these problems might have caused. We will report on the quality of the products with the new sensor as soon as more data are available. There are still problems with degraded OSI SAF sea ice products, due to degraded SSMIS F17 data. The OSI SAF sea ice team will look closely on the problem today and evaluate the possible options for actions. There is unfortunately still problems with degraded OSI SAF sea ice products, due to degradation in some of the SSMIS F17 orbits. This results in false ice in some areas in the OSI SAF sea ice concentration (OSI-401), edge (OSI-402) and type (OSI-403) products, and to some extent the emissivity (OSI-404) and LR drift (OSI-405) products. The OSI SAF sea ice concentration product for the northern hemisphere distributed today (with label 20160407) was degraded due to corrupted SSMIS data. The corrupted data is hopefully a temporary problem, so that tomorrows product will be back to nominal. The OSI SAF sea ice products are back to nominal production today, after the missing SSMIS data from NOAA yesterday. The OSI SAF sea ice products distributed this morning (labelled 20160405) have a sector of missing data due to SSMIS data outage yesterday. The data provider (NOAA) is looking into the problem. Service message will follow when we have more news from NOAA. Todays global ice edge and type products (OSI-402, OSI-403 and OSI-405), labelled 20160229, were degraded due to large missing sectors. This was caused by a processing error. The error has been corrected and new complete products have been distributed to our FTP server (ftp://osisaf.met.no). We have earlier announced that we will upgrade the OSI SAF ice concentration product from OSI-401-a to OSI-401-b today (26. Jan. 2016), see announcement from 29 Oct. 2015. The upgrade is postponed until early March 2016. Consequently, the parallel distribution of the old (OSI-401-a) and new (OSI-401-b) sea ice concentration products will continue until early March 2016. We will inform you about a concrete date as soon as possible and excuse for the inconvenience that this may have caused. Data of lakes have been removed, with the exception of central regions of the great lakes in North America and Lake Ladoga. The data from these regions should be treated with caution, as the sea ice concentration algorithm is tuned for the Arctic and has not be validated over lakes. Last August (Aug. 14th 2015), we announced that the MR Ice Drift products (OSI-407) carried incorrect dates, where the start- and end-date stamps are shifted by one day and the given time-of-day stamps were correct. Current erroneous start_date: "2015-08-12 18:31:00 UTC"
Correct start_date: "2015-08-11 18:31:00 UTC"
Current erroneous stop_date: "2015-08-13 18:10:00 UTC"
Correct stop_date: "2015-08-12 18:10:00 UTC"
Since Sep. 7th 2015 we distribute the files with correct time stamps. However, we announced that the products in the OSI SAF product archive still carry the wrong timestamps. That issue is resolved now. We have updated all of the products in the OSI SAF archive (ftp://osisaf.met.no/archive/ice/drift_mr) so that they carry the correctdates in the filenames and in the start_date and stop_date attributes in the NetCDF headers. The AHL SST (OSI-203) product distributed this morning (time stamp 201601140000) contained no data, due to a failure in the cloud masking chain. The cloud masking chain has been updated, and the production of SST should be back to nominal. A new JGR Oceans paper by Sumata et al. derives empirical error functions for six Arctic sea ice drift products on a monthly basis. The OSI-405 is one of the products under study and shows best accuracies against SAR-based reference ice drift dataset. Sumata, H., R. Gerdes, F. Kauker, and M. Karcher (2015), Empirical error functions for monthly mean Arctic sea-ice drift, J. Geophys. Res. Oceans, 120, doi:10.1002/2015JC011151. The announced upgrade on 3rd November of the OSI SAF sea ice concentration product is postponed until 26th January 2016. The old (OSI-401-a) and new (OSI-401-b) sea ice concentration products have been distributed in parallel for a while. Feedback from users has shown that there are some issues with false ice in lakes in the new product that needs to be fixed before the upgrade can be done. The parallel distribution will continue until 26th January. More details will be provided when the issue with false ice in lakes have been resolved. A sector in today's Southern Hemisphere OSI SAF sea ice concentration and edge products are degraded, due to corrupted input SSMIS satellite data. We recommend that the users use yesterdays (labelled 20151013) product instead of today's (labelled 20151014). Hopefully, the input data will be back to nominal in tomorrows product. Due to a stop in the reception of ASCAT data at MET Norway, todays (timestamp 20150930) OSI SAF sea ice edge, type and low resolution products did not use ASCAT data. Since these are multi sensor products, the products have still been delivered, but based only on SSMIS data (and AMSR-2 for ice drift). The reception of ASCAT data is now back to nominal and tomorrows product should be including ASCAT data again. The sea ice concentration product for Southern Hemisphere has been missing data in a small sector in the inner ice close to the ice shelves boarder for the products the last couple of days, from 14-16th September. This was due to a bug in the input data filtering. This has now been corrected and the products are back to nominal coverage. Missing DMSP SSMIS data from Monterey/FNMOC resulted in reduced coverage and missing data in today's sea ice products (concentration, edge, type) in both hemisphere. We are receiving fresh DMSP SSMIS data and tomorrow's product should have nominal coverage. The OSI SAF LR Sea Ice Drift product was delayed on EUMETCast this morning due to a processing environment error that was introduced during the upgrade yesterday. The problem has been corrected and the production is back to nominal. The distribution to the OSI SAF FTP server was not delayed. The OSISAF medium resolution ice drift product (OSI-407) is back to nominal production and is again distributed again via EUMETCAST and the OSI SAF High Latitude FTP server (ftp://osisaf.met.no/prod/ice/drift_mr) since yesterday night (7th September 2015). The distribution was stopped on Aug 14 2015 due to an error in the production chain, which led to shifted start- and end-date stamps. The error is fixed now. The products in the archive still carry the wrong timestamps. We will inform you as soon as we have update the products in the archive with the correct dates. We would specifically like to remind the users that there are some changes in the format of the LR ice drift product, and no changes in the format for the ice edge and ice type products. The sea ice concentration product (OSI-401) will not be changed now, but on 4th November. Over summer some Sea Ice Emissivity products did not cover their complete area. There are, especially on the southern hemisphere, sectors of variable size with missing data. The issue started to appear on 30. May 2015 and persisted until 21. Aug. 2015. Please find a list of affected products below. The problem is resolved now and products from 21. Aug have a complete coverage again. The issue was caused by a bug in the input file decoding queue. We are sorry for the inconvenience. The sea ice concentration, edge, type and emissivity (OSI-401, 402, 403 and 404) files dated 20150806 contain erroneous data from the DMSP F17 SSMIS instrument in the Barents Sea and Kara Sea regions. The data files have therefore been marked "_erroneous" in the online archive. It is advices not to use these products. The OSI SAF sea ice team is pleased to announce the release of the global continuous reprocessed sea ice concentration offline product (OSI-430). This product is a continuous reprocessing to continue the OSI SAF reprocessed sea ice concentration data set (OSI-409-a) that covers the period 25th October 1978 - 15th April 2015. This offline product is a daily product, is delivered with a monthly delay (33 days) and is available since 16th April onwards. The OSI SAF sea ice team is now ready to introduce improved versions of the sea ice concentration, edge, type and low resolution products. In an overlapping period both the new and old products will be available, for users to test the new products before the new products fully replaces the existing products. Todays OSI SAF Sea Ice products (except the MR ice drift) are degraded with a sector of the products missing. This is due to data outage of SSMIS data from NOAA/NESDIS yesterday. The SSMIS data flow is not back to nominal at time of writing (Wed Jul 1 07:26:32 UTC 2015). The OSI SAF sea ice team is pleased to announce the release of the updated version 1.2 of the reprocessed sea ice concentration data set (OSI-409-a). The data set now covers the period Oct 1978-Apr 2015. Version 1.2 is an extension in time of version 1.1 (OSI-409), adding the period from October 2009 to April 2015. There is no change in the algorithms or processing chain used. Later in June, the OSI-430 off-line product will become available, which will deliver continuous updates of this data set with one month delay. The dissemination of OSI SAF products has resumed this morning. That is, due to an anomaly in the processing chain, there was only one product (S-OSI_-DMI_-MTOP-NH_MRSIDRIFT-201505040613Z.nc) dissiminated yesterday, instead of two. Since this morning production is back to normal. Due to an anomaly in the processing chain the dissemination of OSI SAF Medium Resolution Sea Ice Drift products is stopped until further notice. Todays OSI SAF Sea Ice products (except the MR ice drift) are degraded with a sector of the products missing. This is due to data outage at NOAA/NESDIS yesterday. The production is back to nominal now. The dissemination of OSI SAF emissivity products this morning was delayed due to a server problem. The distribution is resumed and products are available. The dissemination of OSI SAF emissivity products has resumed. The product corresponding to day 2015-03-24 has been distributed with approximately 24 hours delay. This was due to an error in the production chain. Distribution should be back to normal from now on. Due to a network outage yesterday, the OSI SAF AHL SST product with date label 201503241200 was not distributed as expected. The missing product files have now been uploaded to the product FTP server. Todays OSI SAF sea ice concentration product (OSI-401, date label 20150324) is degraded with missing data in parts of the product. This was caused by a network outage. The production is noew back to nominal. Due to an anomaly in the processing chain the dissemination of OSI SAF Sea Ice Emissivity products is stopped until further notice. We are working to correct the problem. The production of OSI SAF Medium Resolution Sea Ice Drift products (OSI-407) is back to nominal. Due to an anomaly in the processing chain the dissemination of OSI SAF Medium Resolution Sea Ice Drift products (OSI-407) is stopped until further notice. We are working to correct the problem. The production of the MR Ice Drift product (OSI-407) has had some problems recently and some products have been delayed. The problems have now been fixed and the production is back to nominal. Due to a major maintenance in the data storage facilities at MET Norway on 29th November 2014, the OSI SAF High Latitude FTP, THREDDS and web server will be partly unavailable during this maintenance. The maintenance will last from 07 UTC to 17 UTC, and the services will at least be unavailable from 11 UTC to 13 UTC, probably longer. This maintenance will affect availability of all OSI SAF Sea Ice products and the AHL SST, SSI and DLI product during this period through FTP and THREDDS, as well as the OSI SAF High Latitude web portal (http://osisaf.met.no). The OSI SAF production should not be affected and the products will be available on EUMETCast as usual. We appologize for the inconveniences this might cause. The maintenance in the data storage facilities at MET Norway on 1st November 2014 has been postponed, and hence there will be no outage of the OSI SAF High Latitude FTP and HTTP servers on 1st November. The maintenance will happen later in November, there will be an announcement about the date soon. The distribution of SSMIS data from NOAA through EUMETSAT is now confirmed to be back to nominal. The production of OSI SAF Sea Ice products is therefor also back to nominal. The production this morning produced products as expected, except for the LR Sea Ice Drift product (OSI-405). This product calculates drift from SSMIS data 48 hours apart. The first LR ice drift product will be available on the morning 26.10.2014. The data stream of SSMIS data from NOAA/EUMETSAT to OSI SAF has now resumed, and the daily OSI SAF sea ice products should therefore be back in nominal distribution tomorrow morning at about 04:45 UTC. The LR sea ice drift product will not be available for another two more days, as it relies on data from two consecutive days. This interruption has not affected the MR sea ice drift product. The network problems at NOAA continues, and todays OSI SAF sea ice products are still missing due to this outage of SSMIS data. The necessary steps to resolve the issue has been taken at NOAA. No OSI SAF sea ice products will be available until this issue is resolved. We are sorry for the inconvenience this data outage might cause. For more information, contact us on email osisaf-manager met.no. The network problems at NOAA continues, and we are still not receiving any SSMIS data. The OSI SAF sea ice products to be produced tomorrow morning (at about 04:30 UTC 23.10.2014) will therefor probably also be missing. We are sorry for the inconvenience this data outage might cause. Due to a problem with the network at NOAA, we are not receiving SSMIS data for the production of the OSI SAF Sea Ice products (concentration OSI-401, edge OSI-402, type OSI-403, emissivity OSI-404 and LR drift OSI-405). Hence, the products from this morning (with time stamp 20141021) are missing. The data stream is yet not back to nominal, so we will be back with more news on this later today. This problem do not affect the MR ice drift product (OSI-407), which is based on AVHRR data. Due to a major maintenance in the data storage facilities at MET Norway on 1st November 2014, the OSI SAF High Latitude FTP, THREDDS and web server will be partly unavailable during this maintenance. The maintenance will last from 07 UTC to 17 UTC, and the services will at least be unavailable from 11 UTC to 13 UTC, probably longer. The OSI SAF sea ice concentration, edge, type, emissivity and drift products (OSI-401. 402, 403, 404 and 405) distributed today (labelled 20141001) have a small sector of missing data (from North Pole to the Kara Sea). This is due to problems with distribution of DMSP SSMIS data from NOAA. The data flow is now back to nominal. The MR ice drift products was not affected by this outage. The Sea Ice Emissivity and MR ice drift products were not affected by this outage. The OSI SAF Sea Ice Concentration, Edge, Type, LR and MR Drift products from 20140601 were not produced and distributed as expected, due to an outage of the production server. The problem have been fixed, and production is back to nominal. The missing products were uploaded to the FTP server in delayed mode. The Sea Ice Emissivity product was not affected by this outage. The OSI SAF Sea Ice Team is happy to announce that the OSI SAF global sea ice emissivity and northern hemisphere medium resolution ice drift products (OSI-404 and OSI-407) are now available through EUMETCast and FTP, since 01.04.2014. On FTP, data is available both as NRT files and in the online archive. The sea ice emissivity product is in a pre-operational state, as it is still being validated. Due to problems with missing updates of TLE elements for geolocation of NOAA AVHRR data, the OSI SAF AHL SST, SSI and DLI products might be degraded or have reduced coverage. The METOP AVHRR data is not affected by this. We are working on getting updated TLE information, and will inform users when the situation is back to nominal. The OSI SAF sea ice products from the last three days are degraded due to an internal disk problem at MET Norway. Some sectors in the ice products are missing data. The problem has now been resolved and the production is back to nominal. Due to problems with the local processing of METOP02 data at MET Norway yesterday 2.April, the Atlantic High Latitude SST and Flux products from 2.April are based on NOAA satellites only. This has resulted in a bit less coverage in the products. The METOP02 processing at MET Norway is now back to nominal. Today's (dated 20140325) Atlantic High Latitude SSI product from OSI SAF was delayed due to an internal error. The missing product has now been uploaded to the FTP server. The product was not delayed on the EUMETCast distribution. The sea ice products distributed today (with time stamp 20140220) have a large area/sector with missing data over Labrador Sea and Gulf of St Lawrence. The coverage is expected nominal in tomorrows product. The sea ice products previously labelled "pre-operational" have changed status back to "operational". The status of the sea ice products was degraded to "preoperational" in January 2013 due to the switch from SSM/I to SSMIS. The use of SSMIS has now been fully validated and reviewed, and the main conclusion is that the quality of the OSI SAF sea ice products with SSMIS is similar or better than with SSM/I. The validation results are presented in this report. The products affected by this change are the sea ice concentration product (new identifier OSI-401-a), the sea ice edge product (new identifier OSI-402-a), the sea ice type product (new identifier OSI-403-a) and the LR sea ice drift product (new identifier OSI-405-a). The introduction of the "-a" in the product identifier is to indicated that there is a major change in the products. In this case, this change is the change from SSM/I to SSMIS. The temporary distribution of two sets of products for comparison (one set based on SSM/I and one based on SSMIS) has now stopped. All distributed products are now based on SSMIS. On Saturday 30th November between 07:00 and 11:00 UTC, a EUMETSAT firewall is being replaced. During this time frame and possibly during the following 48 hours, there is an increased risk of outages of all OSI SAF sea ice products, as well as the AHL SST, SSI and DLI products delivered through EUMETCast. This will NOT influence the products on the OSI SAF FTP server. The OSI SAF Southern Hemisphere sea ice concentration and sea ice edge products were not distributed to the OSI SAF FTP server as expected on 16th November (time stamp 15-11-2013), due to an internal mistake. The EUMETCast distribution was done as expected. The missing files have now been uploaded to the FTP server. As previously announced, the OSI SAF will now stop distribution of some superseded SST and Flux products to the OSI SAF Sea Ice FTP server ftp://osisaf.met.no. This change does not affect the products distributed through EUMETCast. The distribution will stop on 24th September 2013. Please contact osisaf-manager@met.no if you have any questions. The sea ice products distributed today (with time stamp 20130813) have a large area/sector with missing data. This is due to a SSMIS data outage at NOAA yesterday. The data stream from NOAA is back to nominal and tomorrows data product should have full coverage. The OSI SAF high latitudes products distribution on EUMETCast should now be back to nominal. This includes Sea Ice, AHL SST and AHL Flux products. The distribution has been changed to bypass the problem. This might cause that the product and quality flag files are distributed at slightly different times. If users experience any problems, please notify us at osisaf-manager@met.no. Due to connection problems to the EUMETCast upload server from Norway, we still experience some occasional delays for the OSI SAF sea ice, AHL SST and AHL Flux products through EUMETCast. Our team is investigating and we hope the EUMETCast dissemination will soon resume with nominal timeliness. We are experiencing delays in sending some of the sea ice products over EUMETCast. Our teams are investigating and we hope the EUMETCast dissemination will soon resume with nominal timeliness. Due to a technical problem at the common SSM/I and SSMIS processing center in the US, all our sea ice products with date 2013-04-16 show large areas of missing data. The issue is now fixed, data flow is resumed, and we expect tomorrow's sea ice products to have nominal coverage. During Easter there was a problem with the production of sea ice products at OSI SAF. No products were produced for the dates 24th and 25th March. Norminal production was resumed on the 26th. The sea ice concentration, edge, type and drift products have been recovered, but based on SSM/I data instead of SSMIS data (no change in file structure or file naming). The sea ice drift products will not be reproduced. The missing products are now available on our ftp server in the usual directories (ftp://osisaf.met.no/prod/ice and ftp://osisaf.met.no/archive/ice). We are sorry for the inconveniences this data gap might have caused. The OSI SAF FTP server and web portal experienced problems just after midnight today. The upgrade yesterday seems not to be stable, and the servers have been reset to the old setup. The servers are now back on line. The OSISAF high latitude FTP and web portal servers will be upgraded today at 1200 UTC. The services provided by these servers might be partly unavailable during the upgrade, which should take abort 30 minutes. This involves http://osisaf.met.no and ftp://osisaf.met.no. If you have any problems after 1300 UTC, please report to us on email osisaf-manager@met.no. The OSI SAF Low-Resolution Sea Ice Drift (LRSID) product (OSI-405) over the Southern Hemisphere (SH) is now ready for distribution. Disseminations started 7th March, both over EUMETCast and from our FTP server (ftp://osisaf.met.no). The SH files are available at the same directories as the Northern Hemisphere (NH) files, with the same file name convention. The only difference is that \"nh\" is replaced with \"sh\" in the file names. Updated validation report and Product User Manual will shortly be made available in the Documentation section. Note that due to atmosperic noise and surface melting, it is not possible to process reliable ice motion vector during (austral) summer. The availability period for the OSISAF SH LRSID product is accordingly from April 1st to October 31st. Updated validation results for the sea ice concentration and sea ice edge products after the switch to SSMIS are now available at http://osisaf.met.no/validation/val_greenland.html. Select the "last quarter" plots. All the results after 19.02.2013 are based on SSMIS, while the results before are based on SSM/I. The SSMIS products are labelled pre-operational since they have not been fully validated. The test products will be available until the pre-operational SSMIS-based products are declared operational. The OSI SAF has now decided that the switch from SSM/I to SSMIS as input to the operational sea ice products is made permanent. This means that all the OSI SAF sea ice products previously based on SSM/I data are now based on SSMIS. The validation of the sea ice products based on SSMIS is not complete yet, so the status of the products are changed from operational to pre-operational. The products will be pre-operational until the full validation is reviewed later this spring. This will have no influence on the distribution of the products. The file names are also the same as before, so as user you should not see any change. The only change is that the metadata will be updated with correct satellite information and the pre-operational status. More intermediate validation results will be presented here next week. Please contact us at osisaf-manager@met.no if you have any questions. An issue with reduced coverage over ice sheets in the Antarctic has been corrected, with effect from the products dated 21-01-2013. For any questions, please contact osisaf-manager@met.no. As the SSMI data received at OSI SAF are still corrupted, we have chosen to switch to SSMIS data for the operational OSI SAF sea ice products. The use of SSMIS data for sea ice production have been tested for some time, but is not yet fully validated. Still, the tests so far has shown that the difference between using SSMI and SSMIS has only a small impact on the products. This change will impact in the products to be delivered 20-01-2013, that is with date stamp 19-01-2013. The OSI SAF sea ice products produced this morning (dated 2013-01-18) are degraded due to corrupted input SSMI data. The data provider have been notified, but it is uncertain when the input data will be corrected. There are still some problems with the FTP and HTTP servers at the OSI SAF HL Center, osisaf.met.no. The servers will be down for maintenance for up to 30 minutes between 12:00 and 14:00 CET. Due to internal network problems at met.no, the OSI SAF FTP and web servers for sea ice and high latitude SST and Flux products suffers from occasionally slower connection and interruptions. It is uncertain when the cause of the problem will be fixed. We are sorry for the inconvenience this might cause. In case of problems, please contact us by email to osisaf-manager@met.no. Due to network problems at met.no, the OSI SAF AHL SST product were not available in time on the OSI SAF High Latitude FTP server on 8th and 9th December. The products were available in time on EUMETCast. The network problem has now been resolved, and distribution is back to nominal. Due to problems at NOAA ESPC some SSMI F15 orbits were not received by the OSI SAF. This data outage affected the OSI SAF products dated 26112012 and 27112012, where some areas are missing data. The data stream is back to nominal now and the products that will be delivered tomorrow morning (dated 28112012) will have full coverage. Due to network problems at met.no, the OSI SAF High Latitude FTP and HTTP servers were unavailable a few hours this morning. This affected the availability of OSI SAF Sea Ice products, AHL SST product and AHL Flux products through FTP, as well as the OSI SAF HL web portal. The servers are now back online, and the network problems have been resolved. The OSI SAF High Latitude FTP and HTTP servers will have hardware maintenance on Thursday 18th October between 13:00 and 13:30 CET. The FTP server ftp://osisaf.met.no and HTTP server http://osisaf.met.no will be partly unavailable during this upgrade. Parts of the OSI SAF FTP archive of sea ice products is currently compressed with gzip. The compressed files will be uncompressed on Tuesday 16th October. This is to make the files directly available in a THREDDS and WMS server. Both daily, seasonal and monthly graphs are available for the Northern Hemisphere sea ice extent. More information about the graphs are available on the web site. Due to technical problems with the AVHRR production servers at met.no, the AHL SST, DLI and SSI products for high latitudes had reduced coverage on 13th June. The problem was fixed during the evening and the production is now back to nominal. The Low Resolution Sea Ice Drift product now has an online Validation and Monitoring page. It will regularly display updated validation results. Access this new resource here. Validation reports are available at any time from the Documentation section. The NetCDF format of the OSI SAF Sea Ice Concentration, Edge and Type products (OSI-401, OSI-402 and OSI-403) have been upgraded, as well as the file name convention. The reprocessed Sea Ice Concentration product (OSI-409) and LR Sea Ice Drift (OSI-405) product have not been changed. The reason for these changes is to provide all ice products using the same meta data convention (CF-1.4) and to harmonize the content of these three products with the more recent released OSI-405 and OSI-409 products. To assure that the users have good time to adapt to the new format specifications, the old format will be provided in parallel with the new format until 15th September 2012. The OSI SAF sea ice production is now back to nominal and the sea ice concentration, edge and type products should be delivered as normal tomorrow morning at around 04:30 UTC (2012-04-24). The missing products will be reprocessed and will be available on our FTP server (ftp://osisaf.met.no/prod). Due to an unexpected problem with the delivery of SSMI input data to the OSI SAF, we have not been able to produce any sea ice products since 21. April. The problem has been reported to the data provider, and we are hoping for a quick recovery. If all goes well, we might be able to deliver ice concentration, edge and type products as nominal tomorrow morning, 24-04-2012. Sea ice drift products will be two days more delayed, since it uses three days of data. Due to outage of SSMI data from our data provider, yesterdays (produced today) OSI SAF Sea Ice Concentration, Edge and Type products contain some missing data areas. The data stream is now back to nominal and the next sea ice products should be complete. Due to a problem with the distribution of products to our FTP server, the sea ice products were 3 hours delayed at the OSI SAF FTP server today. The distribution is now back to nominal. The SSM/I data stream from NOAA is now back to nominal, and data since 09UTC are available. The OSI SAF sea ice products might still experience missing data areas in the the product that will be distributed around 04 UTC tomorrow (14-12-2011). Due to a problem with the data flow of SSM/I data to NOAA, the OSI SAF has not received SSM/I data since yesterday afternoon. This results in missing orbits of input data to the sea ice concentration, edge and type products and there are a few holes of missing data in the products dated 12.12.2011. This issue has been reported and we hope the problem will be sorted out soon. The NWP input data for the OSI SAF global sea ice concentration, edge and type products have been updated on 12-12-2011. These products now use the 0.25 degree resolution ECMWF NWP fields for the atmospheric correction that is applied to the brightness temperatures. Previously the 0.5 degree resolution fields were used. The update has a minor positive effect on the sea ice products. Fixed bug in uncertainty estimates. Extended data set period, now covering October 1978 - October 2009. From 31 October to 3 November 2011 the EUMETSAT-sponsored training project EUMeTrain will host an event week on Ocean and Sea applications. This EUMeTrain event week consists of several online sessions. The event week should serve as an exchange on the experience for the forecasting on shiproutes, but also advocate the benfits that the use of ASCAT data (Metop) as well as the radar altimetry data povided by Jason-2 can have to the operational maritime forecaster. Registration for this event week is required. When you have registered you will automatically receive the required invitation. For those of you that will miss this event, all the sessions will be recorded for download. EUMeTrain is EUMETSATs largest international training project which develops training material and the supports training in the field of satellite meteorology in combination with other meteorological data sources. EUMeTrains main goal is training and providing training material, supporting the EUMETSAT programs with special weight on hazardous weather events. Further information on the event and the full timetable are available on the EUMeTrain website. Due to a temporary failure of our FTP servers early Monday 10th Oct 2011, todays sea ice products (dated 20111009) were delayed on ftp://osisaf.met.no. Note that this did not impact distribution on EUMETCast. All systems are back to normal now. On October 4th 2011, the AMSR-E instrument stopped functionning due to a problem with the antenna rotation. As a consequence, the Low-Resolution Sea Ice Drift (LRSID) product delivered on Oct 5th, and covering sea ice displacements from Oct 2nd to 4th has incomplete AMSR-E coverage. As of today, no new AMSR-E data was received at met.no and we thus expect reduced or no coverage in the coming days as well. While NASA and JAXA investigate, users of the LRSID product should be prepared to experience limited or no coverage in the AMSR-E single-sensor product, while the multi-sensor/merged product achieves nominal coverage with ASCAT and SSM/I. Missing SSM/I data caused missing sea ice concentration coverage over the Beaufort Sea and Canadian Arctic Archipelago in the NH product with timestamp 06-08-2011 12 utc, and over Cosmonaut Sea in the SH product with same timestamp. Coverage is back to nominal in both NH and SH product files dated 07-08-2011. The distribution of ASCAT data was back to nominal on 16. May at 10:51 (after a data outage since 14. May). The sea ice edge and type products for 16. May therefore had partial coverage of ASCAT data. The product for 17. May had normal coverage. Due to missing ASCAT data since 14. May, the OSI SAF sea ice edge and sea ice type products are currently produced without the expected ASCAT input. These two multi sensor sea ice products are therefore delivered based on SSM/I alone, and the missing ASCAT input may lead to reduced quality. Nominal dissemination of ASCAT data is not expected to resume before 16.May at the earliest. The OSI SAF Sea Ice FTP and HTTP servers will be moved to a new building on 5 May 2011 at 17:00 UTC. This will cause the FTP and HTTP servers with the Sea Ice data and web portal http://osisaf.met.no to be down for approximately 2 hours. A problem has been uncovered with the algorithm used for calculating the errors[uncertainties] in the reprocessed OSI SAF ice concentration dataset. Initial investigations show this problem leads to errors [erroneous uncertainties] being reported higher than supposed to for all concentration ranges. The OSI SAF team will issue a new version of the reprocessed dataset with scheduled release in June 2011. Due to user requests the error terms will be given in this dataset as well as the total error. We apologize for the inconvenience this might cause. For additional information, please contact osisaf-manager@met.no. Due to a processing error, today's OSI-405 AMSR-E ice drift product (motion from 19th to 21st Februar) was not delivered at schedulded time. Both the ASCAT, SSM/I and MULTI-OI OSI-405 ice drift products were processed and distributed according to schedule. The OSI-405 AMSR-E and MULTI-OI files were re-processed and distributed on the FTP server at 09:25 utc. Due to a data outage of SSM/I F-15 data from NOAA/FNMOC during several hours yesterday, the latest OSI SAF Sea Ice products (dated 15.02.2011) have missing data in a sector from 20W to 80W. The data distribution from NOAA is back to nominal and the next sea ice products should be normal. As announced earlier, a new ftp and http server for the OSI SAF sea ice products will be replacing the old server tomorrow morning 10th February 2011. This switch should not affect the users, but in case of problems, please contact us on email: osisaf-prod_AT_met.no. The new server is named osisaf.met.no, but the old addresse saf.met.no will still work as an alias. The sea ice products covering the limited HL area will be removed from EUMETCast distribution on 15 November 2010. The HL sea ice products are superseded by the global sea ice products, as the HL area is fully covered by the NH products. The HL sea ice products will still be available from the Sea Ice FTP server for a few more months (ftp://osisaf.met.no). An article introducing the Continuous Maximum Cross-Correlation (CMCC) method and its validation in the Arctic was published in the Journal of Geophysical Research - Oceans. The CMCC algorithm is implemented in the Low Resolution Sea Ice Drift product of the OSI SAF. Reference to the manuscript can be accessed here. The processing and dissemination of sea ice drift vectors from low-resolution imaging sensors (OSI-405) was succesfully resumed today 4 October 2010. As planned, the first product grid to be disseminated corresponds to drift vectors from 1 October to 3 October. During Arctic summer, atmospheric noise and surface melting prevent the unambiguous retrieval of sea ice motion vectors from the sensors and channels we use. Accordingly, no sea ice motion vectors are distributed from 1 May to 30 September. Throughout the season, ice motion in the Arctic can be monitored on our quicklooks page and product files can be accessed in near-real-time on the OSI SAF HL FTP server. More information on the sea ice drift product OSI-405 is found here. (Phil) Byongjun Hwang, from the Scottish Association of Marine Science (SAMS, UK), performed these two studies during an Associated Scientist activity with the OSI SAF. The OSI SAF Sea Ice products that was supposed to be distributed at 24.08.2010 around 04:30UTC, with timestap 20100823, have been delayed due to failure on the operational processing machine. The delayed files have now bin distributed to our ftp server, ftp://osisaf.met.no/prod/ice, where they can be downloaded. The OSI SAF High Latitude (Sea Ice, SST and Flux) web portal will gradually migrate from http://osisaf.met.no to http://osisaf.met.no. While both websites are currently kept synchronized, users are invited to readily update their bookmarks and start visiting us at the new URL. The two FTP servers ftp://osisaf.met.no and ftp://osisaf.met.no will soon be merged. The OSI SAF Sea Ice Concentration, Edge and Type products on NetCDF format previously available on the FTP server ftp://mersea.met.no/mersea/seaice have now been moved to a new server: ftp://osisaf.met.no/prod_netcdf/ice. The old FTP server will be closed down 24. May 2010. We therefore ask our users to start using the new server as soon as possible. The Opendap server at mersea.met.no has been replaced with a Thredds server available at http://osisaf.met.no/thredds/catalog/osisaf/met.no/prod_netcdf/catalog.html. This change do not affect the Sea Ice Drift products on NetCDF format or the Concentration, Edge and Type files on GRIB and HDF5 format. The OSI SAF Low Resolution Sea Ice Drift (LRSID) product is now available through EUMETCast (starting from today), together with the other OSI SAF sea ice products. The products are delivered on NetCDF3 format, and typical file names are: S-OSI_-NOR_-MULT-NH_LRSIDRIFT-20104071200Z.nc.gz. The products are delivered through this EUMETCast channel: SAF-Global. More details about the sea ice drift product are available in the LRSID Product Manual, available from the documentation section of this website. A new version of the validation and monitoring report for the Low Resolution Sea Ice Drift product of the OSI SAF is available from the documentation section of this website. The new report documents validation results for 3 years (2006-2007, 2007-2008 and 2008-2009) for the single- and multi-sensor datasets. It will later be updated with the 2009-2010 results. Exceptional sea ice conditions in the Skagerrak Strait (between Norway, Sweden and Denmark) and Oslo fjord are monitored with a new algorithm using the Advanced Very High Resolution Radiometer (AVHRR) instrument. This new method is the basis for the upcoming OSI SAF Regional Sea Ice Edge product, scheduled Summer 2010. Daily images of the Low Resolution Sea Ice Drift product are now available from the quicklooks page. For the time being, they are limited to the merged (multi sensor) product, from December 2009 onwards, zoomed over the Arctic Ocean. We are currently working on extending the time series. Dissemination of the Low Resolution Sea Ice Drift product started in mid-December 2009 as daily NetCDF product files available from the OSISAF HL FTP server. Since the updated sea ice edge and type products as well as the new sea ice drift datasets are now distributed from the main FTP directories for sea ice products, their distribution to the ftp://osisaf.met.no/testprod directory will be terminated next Monday (21st December). A RSS feed mechanism was activated from the OSISAF HL website for easing access to our local News items. Interested users are invited to syndicate to this flux with their preferred reader. This functionality is still in a beta stage and was not yet fully tested on all possible news reader nor web browser. Do not hesitate to contact Webmaster for reporting malfunction or missing features. Note: The official News and Services Messages from the main www.osi-saf.org are not part of this RSS mechanism. However, News and Service Messages pertaining to Sea Ice production will be cross-posted on this flux. On December, 9th 2009, the OSI SAF HL processing chain was upgraded from version 3.2 to version 4.0. This upgrade was mainly concerned with the updated sea ice edge and sea ice type products and the introduction of the new low resolution sea ice drift product. The ice concentration production chain was not modified. For easier maintenance and enhanced readibility, the directory architecture for the sea ice drift datasets is modified at the High Latitude FTP server. A similar architecture will be setup for distribution of upcoming pre-operational sea ice drift daily production and archiving at the same FTP server. We apologize for any incovenience this might have caused. The DMSP F-13 SSM/I data are no longer available, due to failure of the last tape recorder. There is therefore only one available satellite with SSM/I data, DMSP F-15. The OSI SAF Sea Ice products are therefore currently based on data from this satellite only. To compensate for less data coverage due to only one satellite being available, the OSI SAF daily sea ice products are now based on 36 hours of data (as announce earlier), instead of 24 hours as they used to be. Due to problems with the recorders on-board DMSP F13 and F15, parts of the SSMI orbits are lost during recorder dumps. This affects the OSI SAF Sea Ice Northern Hemisphere products. To ensure complete data coverage, the OSI SAF Sea Ice team has chosen to increase the period of input data used in the daily sea ice analysis. The latest 32hours of SSMI data are now used, instead of the latest 24 hours. This solution will be used until the second recorder on-board F15 is working again. The OSI SAF Sea Ice team is also working on implementing the use of SSMIS instead of SSMI. The OSI SAF Sea Ice products processed approx. 2009-10-14 04:15UTC, with timestamp 2009-10-13 12:00UTC were degraded in the form of a stripe of missing data covering the European sector (Fram Strait and Svalbard). This was caused by degraded and/or missing SSM/I data. The OSI SAF Sea Ice products processed approx. 2009-03-11 04:15UTC, with timestamp 2009-03-10 12:00UTC contained noise in the form of false lower ice concentration around Greenland. This was caused by degraded SSM/I data. The degraded data have been removed and the sea ice products reprocessed. These corrected products are now available on our anonymous FTP server, ftp://osisaf.met.no/prod/ice. NSIDC (National Snow and Ice Data Center) has reported that the 22 GHz channels on the SSM/I instrument onboard the DMSP F15 is drifting. This may affect the filtering of weather system induced noise in the processing of sea ice products. However, the production of sea ice products at the OSI SAF uses NWP data to correct the SSM/I brightness temperatures. This reduces the noise from weather systems significantly. Therefore OSI SAF sea ice products are at present insignificantly affected by this sensor drift. Anyway, the OSI SAF team is currently preparing for replacing the SSMI F15 data with SSMIS F16 data. All ice products with time stamp 06/11/2008 were delayed on the OSISAF ftp servers. They are now available (11:00 utc). Distribution via EUMETCast was not affected. The daily OSI SAF Sea Ice products have previously been distributed twice daily by mistake at about 04.20 and 05.10 UTC. The distribution has now been changed and the daily sea ice products are now distributed once at about 04.20 UTC. The OSI SAF Sea Ice products producted approx. 2008-09-19 04:15UTC, with timestamp 2008-09-18 12:00UTC contained noise in the form off false ice around Svalbard. This was caused by degraded SSM/I data. The degraded data have been removed and the sea ice products reproduced. These updated products are now available on our anonymous FTP server, ftp://osisaf.met.no/prod/ice. The OSI SAF Sea Ice products producted approx. 2008-08-03 04:15UTC, with timestamp 2008-08-02 12:00UTC were not produced because of a machine overload at met.no. Therefor the products were not available on EUMETCast. The products are now available on the FTP server, ftp://osisaf.met.no/prod/ice. The production is now nominal. Due to a failure in the operation production system (Monday 14th July, approx. 16:00 UTC to approx. 22:00 UTC), the 12 Hourly SST 'High Latitude' products with time stamp 2008-07-14:19h15utc was not delivered. The systems are now back to nominal status and production has resumed as of 2008-07-15:07h15utc. Due to construction work related to the power supply at METNO, the OSI SAF ftp server and web portal for sea ice products may be inaccessible in periods on April 26 and 27, 2008. The OSI SAF Sea Ice products were delayed today because of an internal error in the OSI SAF production system. The error has been fixed. Because of this, the sea ice products were not available on EUMETCast. But the products are available through our anonymous ftp server, ftp://osisaf.met.no under prod/ice. We are sorry for the inconvenience this might have caused. The SST algorithms for NOAA-17 and NOAA-18 for the High Latitude SST product has been upgraded. Validation results showed a negative bias for both satellites. This negative bias was improved by introducing the algorithm coefficients used for the NAR product. The change was effective starting with the 12 hourly HL SST product centered at 1200UTC 14.02.2008, produced at 18UTC. The AMSR-E data stream is up and working again, and the OSI SAF Sea Ice Concentration products are again available. The OSI SAF Sea Ice demonstration product based on AMSR-E data is currently missing. The AMSR-E data are missing from NASA because of a data processing failure. The AMSR-E data stream should be up again by Thursday or Friday this week. The OSI SAF Sea Ice products distribution over EUMETCast was back to nominal this morning and all products available. The OSI SAF Sea Ice products where not distributed over EUMETCast this morning because of problems with the EUMETCast dissemination (channel 3). The problems are being investigated at EUMETSAT and will hopefully be solved soon. The Sea Ice products are also available through FTP at ftp://osisaf.met.no/prod. A new sea ice concentration test product based on AMSR-E is available. The OSI SAF team has implemented an algorithm for processing AMSR-E data for sea ice concentration, similar to the SSM/I based product. The products are available at the download page. A new tool for browsing the daily and monthly sea ice products quality monitoring images is available at the validation pages. These quality monitoring images are the result of the daily manual inspection of the sea ice products performed by the ice analyst on duty at the DMI Ice Service. These images will tell the users if there are any anomalies in the products caused by misclassification, lack of input data etc. The images can be browsed one at the time, or two at the same time for comparison. An archive of these images are available back to September 2006. During Arctic summer season (May-September) the ice type product is dubious because melting of the ice surface obscures the ice type signals. We therefor advice our users not to use the northern hemisphere ice type product in this period. Regarding the southern hemisphere ice type product there is almost no multi year sea ice present throughout the year at all. The Southern Hemisphere sea ice products have now been declared operational by the OSI SAF Steering Group. The SH products are now distributed throught EUMETCast in trial mode until 11. April when they will be operationally available also through EUMETCast. The SH products are now also available in the ftp archive (back to 01.01.2007), under ftp://osisaf.met.no/archive/ice. Yesterdays OSI SAF Sea Ice products are degraded because of missing SSMI data. There is a problem with the SSMI data stream from UKMO/NESDIS. The data stream is now up again and todays product (available tomorrow morning) should be okay. The OSI SAF Sea Ice products were not received over EUMETCast this morning because of a bandwidth problem at the EUMETCast uplink server. The problem was fixed this afternoon. At the status page on 07.12.2006 it is indicated that the OSI SAF Ice products were not received over EumetCAST. This is only the case locally at met.no, due to a hardware failure on the EumetCAST receiving system. A new section with validation information has been added. Validation results for the Sea Ice products is now available under http://osisaf.met.no/validation. The OSISAF processing chain will be upgraded 22 May. New landmask which for example mask out ice plateau in the Weddel in Antarctica. Classification of open water instead of missing data south of 40N (NH product) and north of 40S (SH product). Improved radiative transfer model for 85 GHz. A new global tiepoint set has been developed using principal component analysis to determine clusters of sea ice and open water. It is global, more objective and based on a longer time series than the data set used previously. The monthly tiepoints allow to account for the mean annual cycle in sea ice emissivity. Upgrade of the SSM/I hybrid sea ice concentration algorithm: NASA team is replaced by Bristol algorithm. Upgrade of DLI processing, NWP handling modified. The OSISAF processing chain will be upgraded in week 21. This implies an upgrade of the NCSA HDF5 library used to generate the OSISAF HDF5 files. Previously HDF5-1.4.4 was used, with the new software this will be changed to HDF5-1.6.4. users of the HDF5 files should be aware of this. More information on the algorithm consequences will be provided later. The error in the local reception has been fixed and the production is now running as normal. The Northern Hemisphere (NH) Sea Ice products for sea ice edge, concentration and type are now available throught the EUMETCast service on GRIB format, in addition to the HL products. The file names for these products have the form S-OSI_-NOR_-MULT-GL_NH_CONC__-200602131200Z.grb. More information about these files can be found in the Product Manual for Sea Ice products available under Documentation. More information about EUMETCast is available at the EUMETSAT web pages, http://www.eumetsat.int. A new test product is now available. This is an improved sea ice type product where SSM/I and Seawind Quikscat data are combined in a multi sensor analysis. The current operational sea ice type product only use SSM/I. The test products are available under Products/Download. Documentation about the new test products is available under Documentation. The OSI SAF High Latitude web pages have been upgraded. The design have been changed to better resemble the main OSI SAF pages. A new page with production status have also been added. So far only for sea ice. Flux and sst will be added. The problem with the Internet connection have been repaired. The distribution of Sea Ice products through EUMETCast is back to nominal. The Northern Hemisphere Sea Ice product has been reviewed by EUMETSAT and is close to be declared for operational. It will then be disseminated through EUMETCast together with the HL product. This dissemination is expected to start in December 2005. A new updated version of the Sea Ice Product Manual (v3.2) is available. See under Documents. The problem with the Internet connection between OSI SAF/met.no and EUMETSAT have been identified and will be repaired. In the mean time a backup distribution has been established and the OSI SAF Sea Ice products are now available again over EUMETCast. The products might be a bit delayed compared to usual dissemination. There is a problem in the FTP-connection between OSI SAF/met.no and EUMETSAT. The Sea Ice products are therefore not available over EUMETCast (since 16.10.2005). We are investigating the problem. The Sea Ice products are available at the OSI SAF Sea Ice FTP-server. Some changes on the web-pages, mainly design and added some information. New versions of sea ice product manual and osihdf5 format documentation, see under Documents. The was a cut in the SSM/I data stream from UK Met.Office which caused some areas with missing data in the OSI SAF Sea Ice products from 04.09.2005. The data stream is now working as usual again. The products from 04.09.2005 have be reproduced, and the data products at the ftp-server have been replaced. Sea Ice products for the Southern Hemisphere (SH) are now available at the ftp-server ftp://osisaf.met.no/prod, together with the Northern Hemisphere (NH) and northern Atlantic (HL/multi) products. These products are test products as they are still being validated, and must be used with precautions. They will be available at the ftp-server under the same processing conditions as for the NH products. The SH products have not yet been masked for the large ice shelves or coastal glaciers. This will be done in autumn 2005. The was an anomaly in the SSM/I data stream from ECMWF which caused large areas with missing data in the OSI SAF Sea Ice products from 21.06.2005. The error has been corrected and the products from 21.06.2005 have been reproduced. The data products at the ftp-servers have been replaced. The Flux products were not processed last night due to a forced server reboot, the problem is being investigated. OSI SAF ice concentration and SST products are from today used daily in the HIRLAM20 model. SST fields are updated at 00 ad 12 UTC from the MAP (Merged Atlantic Product) product. Ice concentration fields are updated from O&SI SAF ice products at 12 UTC daily. No SST product today caused by problems with AVHRR data retrieval. * New sea ice product area covering the Northern Hemisphere. * Small changes to the sea ice data formats (see Sea Ice Users manual v3.0). * Smaller changes in SST and Flux software. * General upgrade of the software. * Use of AVHRR data processed by AAPP and ANA. * Improved software for SSI and DLI products. * Quickscat ice type products are now available for test purposes. The NOAA-16 satellite is now removed from the SST-processing because of malfunctioning AVHRR instrument. From 13.04.2004 SSM/I data is decoded north of 40 degrees, instead of 50 degrees. Leading to a larger coverage in the ice product. Flux products quicklooks are now available! Flux products are now available for download. Quicklooks will soon be available. The documentation page is updated and new scientific and technical documents are available. The documentation page is updated and new documents available. The problems concerning quicklooks of sea ice products are fixed so updated products should be available from now on. Quicklooks of the sea ice products have not been generated for some days due to a processing problem. The problem is identified and will probably be fixed within this week. The High Latitude Ocean and Sea Ice SAF website has been redesigned and products are made available both in full resolution HDF5 and GRIB files, as well as in a quicklook archive set up with JPEG imagery in thumbnail and full format.